1) Maithripala Sirisena sworn-in as Sri Lanka's new President: Maithripala Sirisena was sworn in as the sixth president of Sri Lanka on 9 January 2015. Sri Lanka's Supreme Court Judge K Sri Pawan administered the oath of office to Sirisena at the Independence Square in Colombo. UNP leader Ranil Wickramasinghe was sworn in as Sri Lanka's prime minister. Following the defeat, Rajapaksa vacated Temple Trees, his official residence in Colombo's sea-facing Galle Road. 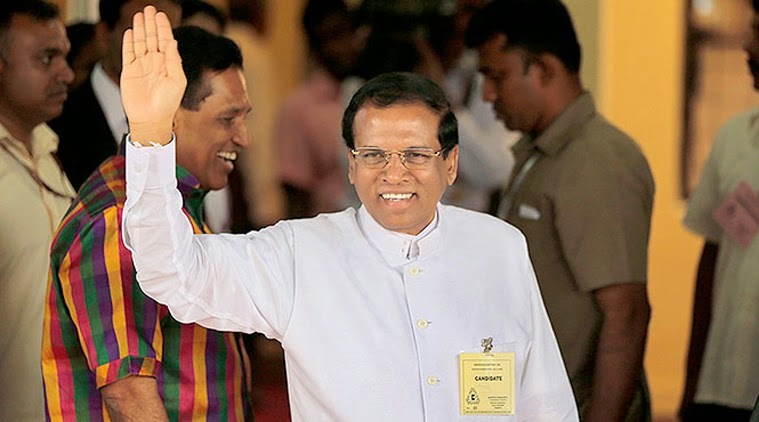 Pallewatte Gamaralalage Maithripala Yapa Sirisena (63) was Health Minister in the Rajapaksa government and senior member of the ruling Sri Lanka Freedom Party until he broke ranks on November 21 to become the presidential candidate for a common opposition. 2) Governor's rule imposed in Jammu& Kashmir: Governor's rule was imposed on 9 January 2015 in Jammu & Kashmir in the wake of efforts at government formation remaining unsuccessful and Omar Abdullah triggering a crisis by declining to continue as the caretaker chief minister. The proclamation placing the state under governor's rule was issued under Section 92 of the Constitution of J&K. This provision authorizes the governor to assume functions and powers of a state government in case he is satisfied that the latter cannot function in accordance with the provisions of the state's Constitution. 3) Vistara operated its first flight from Delhi to Mumbai: Vistara, the new airline of Tata SIA Airlines, on 9 January 2015, commenced commercial operations. The maiden flight from Delhi arrived in Mumbai at 2.50 p.m., and received the traditional water cannon salute. With a fleet of three Airbus A320 aircraft, the airline will initially operate in the Delhi, Mumbai and Ahmedabad sectors. This is the second time the Tatas have entered the full service airline business. In 1932, the Tatas had started Tata Airlines, which was renamed Air India in 1946, and was subsequently nationalised in 1953. 4) Scientists created first new antibiotic in nearly 30 years: In a massive breakthrough, scientists have created the first new antibiotic in more than three decades and named it 'Teixobactin'. The discovery comes at a time when World Health Organization has sent out warnings that humanity is staring at a post-antibiotic era when common infections will no longer have a cure. The first antibiotic, Penicillin, was discovered by Alexander Fleming in 1928, and more than 100 compounds have been found since then, but no new class has been found since 1987. 5) Yu Min, 'father of China's H-bomb', won top science award: Breaking the secrecy over its nuclear scientist who developed its first hydrogen bomb, China on 9 January 2015 honoured nuclear physicist Yu Min with a top award, 48 years after the event. Chinese President Xi Jinping presented the award to Yu, 89, an academician at the Chinese Academy of Sciences, at a high-profile annual ceremony held to honour distinguished scientists and research achievements. 6) NASA's Kepler Space Telescope discovered 1,000th alien planet: NASA's Kepler spacecraft has discovered its 1,000th alien planet, further cementing the prolific exoplanet-hunting mission's status as a space-science legend. Kepler reached the milestone on 6 January 2015 with the announcement of eight newly confirmed exoplanets, bringing the mission's current alien world tally to 1,004. 7) World Congress on International Law inaugurated by Vice President at Delhi: The Vice President of India Shri M. Hamid Ansari inaugurated the World Congress on International Law on the theme “Relevance of International Law” organised by the Indian Society of International Law (ISIL). 8) Railway minister launched safety app for women: Railway minister Suresh Prabhu inaugurated a mobile application for women commuters. The app does not require a GPS or internet. The application, ‘m-Indicator,’ allows women passengers to avail themselves of immediate help from the Railway Protection Force with just an SMS. 9) Pravasi Bharatiya Samman Awards 2015 presented: Vice President of India Mohammad Hamid Ansari on 9 January 2015 presented the Pravasi Bharatiya Samman Awards 2015 to sixteen personalities. The awards were presented during the occasion of Pravasi Bhartiya Divas at Gandhinagar, Gujarat. Microsoft CEO Satyanarayana Nadella (Satya Nadella) and Guyana President Donald Rabindernauth Ramaotar are important personalities among them.